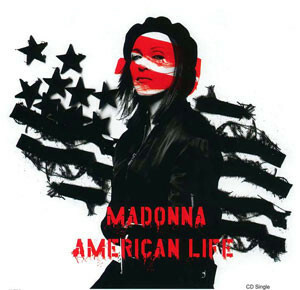 “American Life” was the lead-off single for Madonna’s 2003 album of the same name. This single is the edited version of “American Life” that was played on the radio rather than the version that appears on the American Life album. In the song, Madonna talks about trying to deal with fame and trying to be the best. A rap in the song first talks about how people perceive her: she has all these wonderful things that many only dream of having, and how people make assumptions that Madonna is satisfied. Near the end of the rap, however, Madonna talks about having lawyers, chefs, nannies, etc., and poses the question, “Do you think I’m satisfied?” In the last line of the rap, Madonna seems to express a sense of disillusionment: “I’m just living out the American dream, and I just realized that nothing is what it seems.”. Overall, this is a pretty decent song, and I have to admit that I prefer the radio edit of the song over the album version. The profanity thrown in during the rap breakdown in the song doesn’t really add anything, in my opinion. This CD single for “American Life” is backed with “Die Another Day [Calderone & Quayle Afterlife Mix].” This remix features a throbbing bassline and drum loop which never seems to progress throughout most of the mix. The intro runs for three minutes before the lyrics kick in, and the mix in general is just too long. For those who are curious, this remix is almost nine minutes in length. Unfortunately, simply making an edit of this mix would not be enough to save it; honestly, I didn’t think it was a very good remix of “Die Another Day.” After hearing this mix, it’s easy for me to understand why this was left off the “Die Another Day” maxi-single. The sticker that appeared on the shrinkwrap of this single claims that the disc is “enhanced with Madonna extras.” However, all that’s on the enhanced portion is a weblink to a website that features streaming video of behind-the-scenes footage and Madonna buddy icons. Since it’s been almost 10 years since this single was released, I have no idea if the content that was linked to in the enhanced portion of the disc is even available online anymore. I wrote this review after listening to a copy of the “American Life” CD single that my husband and I purchased.